Gmail went down. Nobody panic. 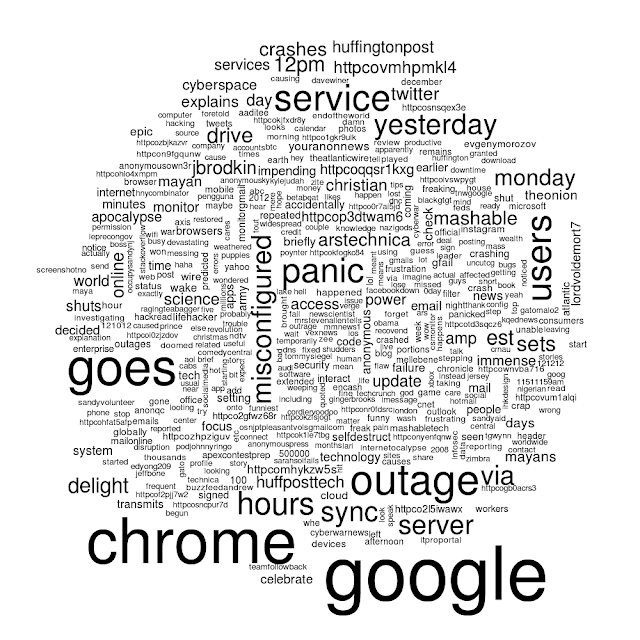 Source: 1500 random tweets from today with the terms ‘gmail down’ (pulled from API). Author mylesPosted on December 11, 2012 Categories google, quick plot, R, wordcloudLeave a comment on Gmail went down. Nobody panic. Wow, with Google Fusion Tables now it’s a snap to produce a quick map. Upload, click, click, geocode and boom! Your data are on a map! City of Toronto open data for new bicycle posts and rings installed in 2011. Author mylesPosted on June 12, 2012 Categories geospatial, google, open data, quick plot, torontoLeave a comment on Wanna go ride bikes? Google’s mission is to organize all the world’s information and make it universally accessible and useful. In following their mission, the company has produced some amazing tools which allow any internet user to do some data visualization without so much as having to open a spreadsheet. One of these tools which I stumbled across the other day (which apparently has has existed for some time) is Google Domestic Trends. I was previously aware of Google Trends, which allows a user to compare the popularity of different search terms, whether if be for serious reasons (e.g. Android vs. iPhone) or say, for something less serious. In Domestic Trends, Google has aggregated relevant search terms across different sectors of the economy, with the results presumably providing insight into market trends by sector (or at least the popularity of those market sectors with respect to time). I am not an economist, but data are data, so here goes with the pithy commentary and observations. It’s seasonal, unsurprisingly. Looks like there might be some deals over the holidays I was unaware of. Or that might be a really bad time to buy tickets. As Google notes on the Domestic Trends frontpage, July 2009 was when the U.S. Government instituted its “Cash for Clunkers” program. However, it was also when Toyota recalled almost half a million vehicles due to defective airbags. Oh yeah, and that spike in 2005 is related to the outrageous change in the gas prices of the time. New record. I’m glad I rent. Seriously, who buys desktops anymore? A poignant portrait of the changing state of the American economy and personal debt. Merry Christmas honey, I got you a Rhoomba. I want to say that the little spike later in 2011 has nothing to due with employment and is due to Mr. Jobs retiring, however then I would expect a much larger one to be in October. The iPhone was revealed to the public on January 9th, 2007 and went on sale in June of the same year. The iPhone 3G and 3GS came out in June and July of 2008 and 2009 respectively. The 4S was released in October 2011. Not sure about mid-2010. The Blackberry Torch came out in June but that would hardly warrant what we see here. Apparently it is quite seasonal. Peaks drop off around late July and early August. Students, I would guess. We’ve seen this before. No surprises here. I know the word you’re thinking of. It’s on the tip of your tongue and it starts with ‘R’. See also: Google NGram Experiments.